So we did moan and groan that week, so what, can't blame anyone (include me) ! This summer, mercury kept rising and temperature reached a record breaking almost 37C. We wilted, we melted and we were baked and struggled in stifling heat even though fans were going flat out in the house. Generally most Brits always welcome sunshine, brightness and pleasant summers but this time we wished for rain and cooler breeze as we couldn't face that hot week. Sooo many people took the mick out of Brits and called us sulky, but that's only because they can tolerate above 45C! They forget that generally the UK doesn't face this type of extreme weather and this country is not ready for it. We are comfortable with classic British summer: 3-4 days sunshine and rest of the days are thunderstorms! Especially extreme hot conditions are risky for very young children, pregnant women and elderly people and sometimes it brings fatal injuries to these groups. People with medical conditions such as asthma, hay fever and allergies suffer a lot, and I know because my two babies are victims! Also most of the UK houses are without AC as we don't need them, maybe one fan is enough and that too keeps collecting dust in the loft most of the time, so once in a while when we come across unexpected changes in the weather, don't blame us Brits! No one says anything when foreigners are wearing thick coats and scarves in our 25 degree heat. Because we were gasping in the heat, and making every effort to stay cool, our appetite collapsed. For me it was far too hot to cook, automatically cut down on hot meals and craved for fruit, cold salads and sandwiches that combine minimum cooking time with full taste on hot days. We decided and agreed that only one hot meal will be sufficient for us. 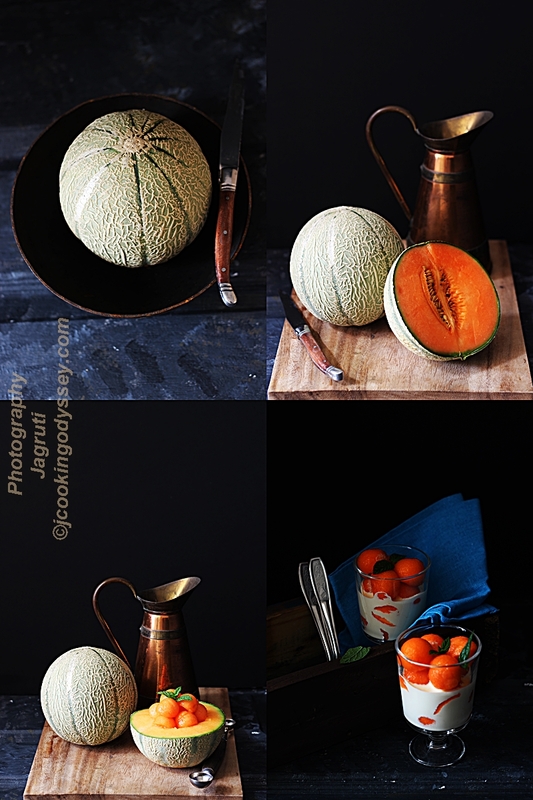 Along with pots of yogurt my shopping bag was full of summery and colourful fruits and vegetables, especially I adore any kind of melons during hot days. While I was talking to Dad on the phone telling him about those 'HOT' days, same time I was gorging on juicy and sweet cantaloupe. I was telling him, how I went crazy and bought plenty of melons, he asked me 'have you ever made teti panna over there ?' As soon as I heard about teti panna, my mind flooded with memories during my childhood in India. I thanked him for reminding me about this dish and promised that definitely that same evening I will prepare Teti Panna. Mum used to prepare Teti Panna during those scorching summers, especially when in the markets there is little fresh vegetables available. We siblings always happy to eat this as we wanted to avoid those summer vegetables like Okra, Karela and lauki ( Indian summer squash ). So instead of sabji, Teti Panna with Paratha, a delightful combination was keeping us cool and happy. Teti Panna, Cantaloupe in sweetened milk is light, refreshing and satisfying dish. This can be made in a jiffy and can be prepared as light summer dessert. This dish ticks all the boxes, when you desire to have fresh, summery flavours with maximum taste ! So that evening family was treated with Teti Panna, everyone was delighted to have such a yummy dish and finished big serving bowl in one sitting. I prepared this dish how my mum used to, only one change I made, white sugar out and palm sugar paste in, taste wise no difference at all! Combine milk, cream and sugar in one bowl and chill in the fridge.Use a melon baller to scoop out the flesh from cantaloupe or just use knife to cut and cut into bite size. Leave it in the fridge to cool.When ready to serve pour chilled milk mixture over cantaloupe and mix everything.Top it up with mint.Enjoy ! thank for share. I like fruit juice. So i will make it for my kids. This is great recipe. I will try to make it. oh God this looks so delicious. I will try this for my dinner desert tomorrow. Thank you so much for writing this recipe!